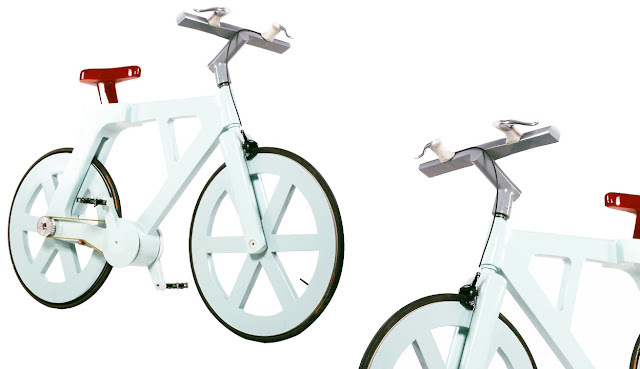 Ultra Light Weight yet stronger than Carbon Fiber; the Cardboard Bike by Avri Gilad! The Cardboard Bicycle Project is a new, revolutionary and green concept by Israeli designer Avri Gilad that produces bicycles which are made of durable recycled cardboard. Perhaps even more groundbreaking than Frank Gehry's iconic Cardboard Furniture Series for Easy Edges; Avri Gilad's Cardboard Bike uses close to 100% recycled materials and will have the option of an electric motor. Its extremely reasonable price tag makes it the perfect bike for any environment and any budget; from New York City to the Ethiopian Desert. The Cardboard Bicycle can withstand water and humidity, part of the ground breaking new technology which makes it look like hard lightweight polymer, stronger than carbon fiber and can carry riders weighing up to 485 lbs (220 kilograms). The cost to make the bicycle is around $9-$12 with a suggested sticker price of $20.